Gardening is so rewarding at this time of the year. Nature is extraordinary: it wakes up from a turbulent winter and pushes bulbs out of the soil. They take a peek with their flowering heads to see what's happening in 2019. From there on, it's a progression of changes in the garden as buds, leaves and flowers come flooding through from now until late June. The ground has awoken and we want to get planting. But what do we plant - what would be the basis of a good collection of trees, shrubs, herbaceous perennials and grasses? Here's my capsule collection of firm spring favourites. These are plants which tend to do well, given the right conditions in gardens on our island. A beautiful way to herald spring in your garden is with some blossom. Magnolias can grow to great heights but there are suitable varieties for the smaller garden, my favourite being 'Leonard Messel'. It's a medium deciduous tree with pretty strap-like fragrant flowers on bare stems in early April and, unlike many magnolias, it will tolerate alkaline soil. Another advantage to this variety is that it will start to flower quite young, unlike the bigger trees which will take years before they set flower buds. Conditions: Moist but well-drained neutral to acid soil; full sun or part shade with shelter from cold winds. Paperbark maple comes from a family renowned for its autumnal colours. The one I've chosen for you will also shimmer long after the leaves have gone, as it has the most beautiful peeling cinnamon-coloured bark that glows in winter sunlight. Conditions: Most types of soil that are moist but well-drained soil; in sun or partial shade. I'm a big fan of any of the birch species. Their outline form tends to be interesting, especially if you have a multi-stemmed species, and this variety has a beautiful white trunk. If you live in a high-traffic area, wash their stems occasionally to keep the bark gleaming. Conditions: Most soils; sun/partial shade. Granny's bonnet is one of the prettiest flowers you can introduce to your garden - and it's easy too. It has lovely fern-like foliage and delightful flowers in lots of Smarties colours. 'William Guinness' is my favourite - dark purple flowers with white central petals. Conditions: Fertile, moist but well-drained soil; sun or dappled shade. 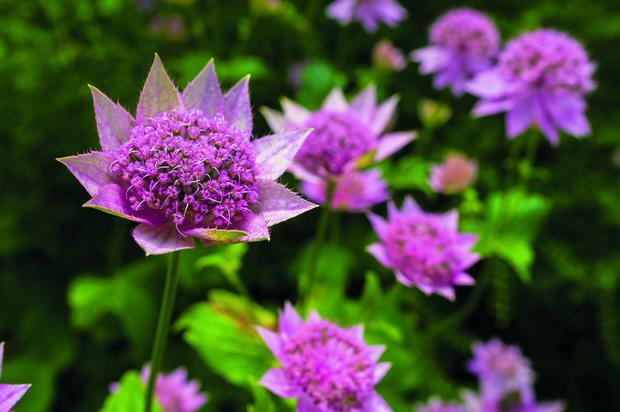 Astrantia major is a cottage garden favourite, a reliable plant that likes to please and keep flowering for you for a long, long time. Often used in Chelsea Flower Show gardens in May, it will flower throughout the summer. Available in white, pale pink and some really vibrant deep pinks and reds. Conditions: Moist soil; partial shade. Salvias are very 'in' and for a good reason. I'm not talking about the red bedding plants but the rich purple, blue and violet types of flowering sage. They have rigid but attractive foliage and produce blossoms for months on end. There are delicious varieties from 'Mainacht' to 'Caradonna'. My tip is to repeat-plant them in a border, so grow pools of these salvias and they will also look wonderful in a terracotta pot. Hardy geraniums are possibly the handiest of all the perennials. 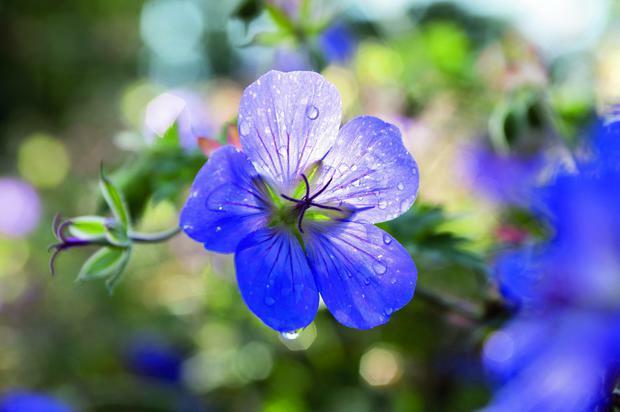 These geraniums creep along the ground, producing a carpet of foliage and wonderful long-lasting flowers, which can be small and dainty or full of drama. In no time at all, they'll be doing the job of suppressing weeds while providing enjoyment for you. 'Rozanne' is one of the best - non-stop blue flowers until November. Conditions: Moist but well-drained soil; sun/partial shade. For a cottage garden, or even a cottage garden effect, in part of your garden, you can't beat foxgloves. An edge-of-woodland plant, they produce large velvety leaves and then send a group of central spikes up which drip with bell-shaped flowers. They are utterly gorgeous; however, always be aware that they are also poisonous to children and adults. This isn't generally a problem, as they are not attractive to eat, but it's best to point it out. Conditions: Most soils; prefers dappled shade. 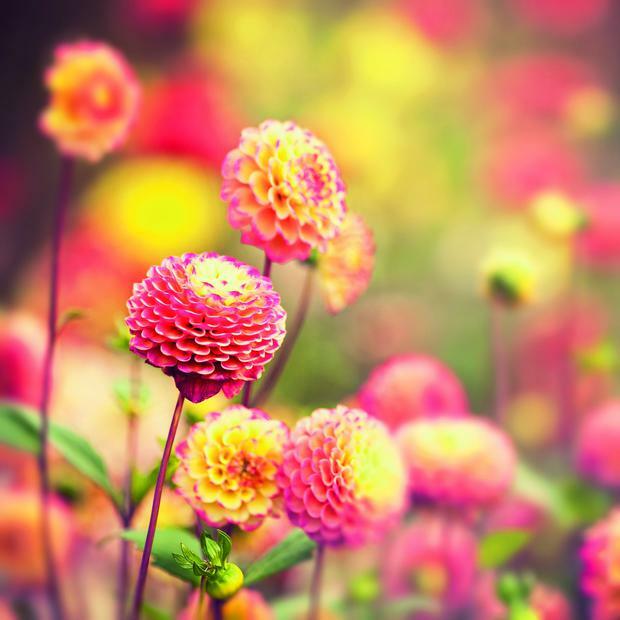 Dahlias are definitely back in fashion and it's easy to understand why. The variety is huge and their rich colours really add depth to the borders in August and welcome flowers at the end of summer. Great to grow as cut flowers. The 'Bishop' series combine vivid flowers and dark-plum foliage. Remember, dahlias will need to be lifted at the end of summer, before winter sets in, and stored in a dry, frost-free environment. Conditions: Moist but well-drained soil; full sun. A favourite from the Chelsea Flower Show. Tall, sturdy stick insects of plants with wisps of purple at their end. They hang like a cloud over borders, self-seed and are an utter delight. They're so easy to grow and give the impression you are an accomplished gardener even if you're not! Nepeta is a great filler plant. Like most of these flowering plants, it really does appreciate the sun. 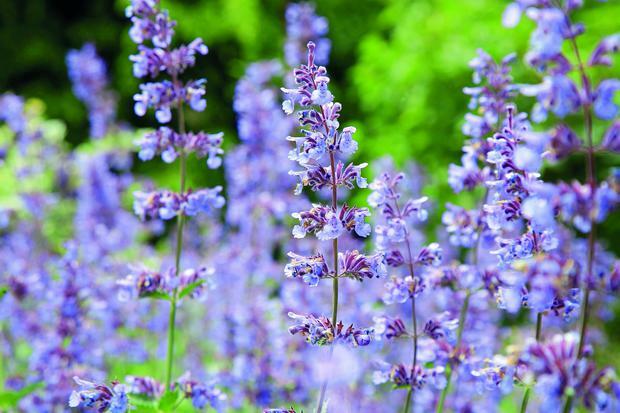 Colloquially known as catmint, it's simply a cushion of grey, minty foliage which is covered in the most beautiful blue flowers. Easy to grow and one for the wildlife - bees and butterflies love it. Geums are good-value plants - undemanding and keep pushing out flowers right through to autumn. 'Totally Tangerine' is a zingy orange while 'Mai Tai', a relative newcomer, has lovely ruffled flowers which are soft apricot/peach. Conditions: Moist well-drained soil/ well-drained soil; sun. Japanese forest grass has beautiful, broad green leaves that arch gracefully to create a waterfall appearance. Unlike many grasses, this will be happy in the shade, forming a beautiful, soft mound that will pair well with ferns, hostas and hellebores. Interest remains in autumn as the leaves turn orange. Conditions: Humus-rich, well-drained soil; sun/shade. This is a variegated compact form of feather reed grass. It has a slim silhouette with slightly arching green and white leaves accompanied by clouds of fluffy pink flowers that turn wheaty-gold, ripened by a summer sun. Excellent dotted through planting to give vertical interest. Conditions: Moist, humus-rich soil; full sun. So many roses from which to choose but if it's fragrance you're after, look no further than this shrub rose named after that great gardener and perfector of the herbaceous borders, Ms Jekyll. It's a powerhouse of incredibly fragrant, rose-pink flowers, and a regular job keeping them dead-headed. Conditions: Fertile, humus-rich, moist but well-drained soil; full sun. It's the epitome of the flower garden. A Mediterranean shrub which needs lots of sun and will appreciate a slightly sheltered position. The variety I'd go for is 'Munstead', an English lavender compact enough for small gardens. Wonderful when sowed in drifts or edging a pathway to the front door. Conditions: Moderately fertile, well-drained soil; full sun. Hydrangeas love growing in our climate. Drive along the boreens of Cork or Kerry in late summer and you'll see huge mop-head blooms in hues of pink and purple delighting the landscape. 'Annabelle' remains a favourite in the posher city suburbs - its white flowers come at a handy time when other flowering plants are a little tired. Conditions: Grow in moist but well-drained soil in full sun or partial shade. If you'd like a rampant creeper that has a presence year round, with attractive foliage and lots of lovely bright flowers, choose this. It's quite hardy - the occasional frost this year hasn't damaged it. Conditions: Fertile, moist, well-drained soil; sun. Clematis goes through periods of being 'in' and 'out'. It's a climbing plant, mainly deciduous. It can be a little tricky to grow because its roots like one condition - shady and damp - but its shoots, stems and flowers love to climb towards the sun. It can suffer from a disease called clematis wilt, so you plant it a little deeper into the soil than almost every other plant. This means if it is killed off, a new bud will emerge in its place. The rewards are climbing plants with often big bright, star-like flowers, sometimes streaked with secondary colours which delight in their simple shape. Conditions: Moisture-retentive, well-drained soil; sun. For a touch of romance or cottage-garden charm, no garden can be without climbing roses. They can take a while to get established and they do need some careful pruning but the rewards of having a rosy arbour or the façade of a home covered in a profusion of blossoms is mesmerising. Contemporary breeders such as David Austin and Peter Beale have managed to develop species that are more resistant to pest and disease and have long or repeated flowering seasons. An old favourite is 'Madame Alfred Carrière', a strong and reliable climber with white to pale pink fragrant blooms that will even do well on a north-facing wall. All roses are heavy feeders so prepare your ground well and dig in plenty of rich humus. Conditions: Humus-rich, moist well-drained soil; sun, partial shade.